Alice Walton and her family get a lot of press—and deservedly so—for supporting the arts in Arkansas, but they aren’t the only funders to watch in a state with a rapidly evolving philanthropic ecosystem. Consider recent gifts from the Little Rock-based Windgate Foundation. Roughly two years after committing $40 million to the University of Arkansas to create the Windgate Art and Design District in Fayetteville, the foundation announced a $20 million gift to the University of Central Arkansas (UCA) in Conway. The gift will support the Windgate Center for Fine and Performing Arts with the goal of making UCA a “regional leader of the arts.” The 114,000-square-foot facility includes 44,000 square feet of art space, a concert hall, a proscenium theater, class space, a studio, and a rehearsal and design space. Established in 1993, Windgate Foundation focuses on funding educational programs in contemporary craft and visual arts, art history preservation efforts, as well as providing funding to K-12 and higher educational institutions to develop and support the arts, scholarships and effective instructional programs. Windgate Foundation has provided over $751 million in grants since its inception. Windgate Foundation’s gift to UCA is the largest in the school’s 111-year history. Prior to the commitment, the largest gifts to UCA included a $5.6 million donation in 1996 from the Donald W. Reynolds Foundation for Reynolds Performance Hall, and a $3 million gift from Conway Corp in 2014 to build the Conway Corporation Center for Sciences. 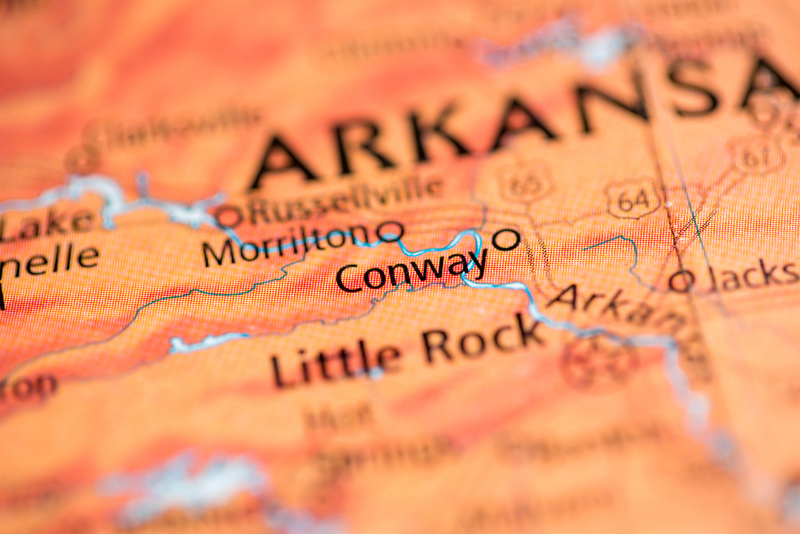 The $20 million Windgate gift is a pretty impressive leap over the previous record, and it suggests that the philanthropy boom in the South, and Arkansas in particular, is showing no signs of slowing down. According to a recent report by the Southeastern Council of Foundations, the state, along with Kentucky and Louisiana, saw the greatest growth in foundation assets over the past 10 years. Meanwhile, the Generosity Index (Fraser Institute) ranks Arkansas 19th and above average regarding local charitable giving. Anecdotal evidence corroborates these findings. Last year, Arkansas State University announced it raised a record $40.1 million in donations and pledges. Around the same time, the Winthrop Rockefeller Foundation made a $100 million commitment to the University of Arkansas System and the University of Arkansas’ Winthrop Rockefeller Institute, proving that the Waltons aren’t the only dynastic family cutting big checks in the state. The Waltons are, however, the most generous family in the state. According to the Grantsmanship Center’s ranking of Arkansas-based foundations published prior to the Winthrop Rockefeller and Windgate gifts, the Winthrop Rockefeller Foundation came in at No. 7 at $4.5 million; Windgate was third at $55 million. The Walton Family Foundation was No. 1 with total annual giving eclipsing $439 million. The Walton family shadow looms large over the state’s philanthropic ecosystem in other ways, as well. Way back in 2001, Jeff Porter of the Arkansas Democrat-Gazette noted that over half of the $2 billion in assets held by Arkansas’ 261 private foundations comes either directly or indirectly from the Waltons. Here’s just one example. In 1978, Walmart bought out Hutcheson Shoe Co. of Fort Smith. In turn, proprietor Bill Hutcheson Jr. became a vice president for Walmart. In 1993, his mother, Dorothea Hutcheson of Fort Smith eventually endowed the Windgate Foundation with a donation of Walmart stock. Her estate continued giving stock and cash after her death in 1996. The UCA gift caps a busy six months for Windgate Foundation. In August, the foundation made two $1.5 million gifts to endow curatorial positions at the Little Rock-based Arkansas Arts Center. An additional $3 million was earmarked for funding directed by the board of trustees. The foundation also pledged $5 million toward the capital campaign to renovate and expand the Arts Center, a project that will break ground in fall 2019 and is scheduled for completion in spring 2022. A month later, it awarded $6.7 million to build a facility for sculpture and ceramics programs at Arkansas State University’s Jonesboro campus, the largest gift to the arts in the university’s 109-year history. It gave Asheville, North Carolina’s Center for Craft a $5.7 million gift to endow the center’s fellowship programs. In October, it awarded the University of Arkansas at Pine Bluff $2.2 million to establish a scholarship endowment and fund an exhibition. And last month, it gave $12 million to the Fort Smith Regional Art Museum to endow its general operations and programming. Which brings me back to Windgate Foundation’s historic gift to UCA. Practically the entire gift, $19 million, is earmarked for new construction. The remainder of the project will be funded through additional private gifts and other resources for a total estimated cost of $45 million. The remaining $1 million from Windgate is in addition to the current Windgate Scholarship Fund, which was established within the UCA Foundation in 2005. UCA President Houston Davis underscored the importance of Windgate’s gift for a public university such as UCA. "We knew that there were a number of interests in providing funding for the arts," he said. "This will allow us to be able to go out and engage with other donors, bring other private money to the table and really be able to leverage a scarce public dollar with the number of private dollars and do something there's no way we could do without that partnership."